THOUGH the comedy has been inspired by Padosan, it has its rib-tickling moments. Even the name is a take-off on one of the most memorable songs of the sixties blockbuster. Yet, the new late night show, Samnewali Khidki every Friday at 11.30 p.m. on Star Plus grabs your attention because of its situational humour. The story revolves around a young single mother, Sanjana (Archana Puran Singh), her six-year-old son Bobby and a friendly neighbour Amit, who is an aspiring film star. Sanjana decides to advertise for a housekeeper to manage her house and her unmanageable son. Unknowingly, neighbour Amit applies and is found most suitable. Soon enough, the job turns into a roller coaster ride for Amit, who falls in love with Sanjana and is now looking for more than just housekeeping! There’s love in the air, but Amit and Sanjana won’t acknowledge it. What follows is a series of occasions and incidents throwing both of them together, making for a long courtship. Produced by Archana Puran Singh’s husband Parmeet Sethi, Samnewali Khidki may not match up to Mehmood’s comedy but it has its funny moments that will keep you regaled. Imagine Sholay without Gabbar, Mr India without Mogambo, Kati Patang without Shabbo. No Amjad Khan, Amrish Puri and Bindu were not the lead stars but without them these films would have lost all their frills and thrills.... Enter the villains and vamps. The baddies who actually make lead stars look like... well, lead stars. Not just in films, even on the small screen the vamps are having a ball. On them hinges the success — and failure — of any soap. Such is their popularity that they are endorsing products and dictating fashions as they personify the bare-and-dare side of life. Be it Ramola Sikand (Sudha Chandran) wearing a power suit or Sheetal Singhania (Nigar Khan) adorning an expensive necklace or even a Kamolika (Urvashi Dholakia) with her startling sense of make up — the viewers are lapping it all up. With the excitement they are generating, lead stars too are seeking vamp roles. 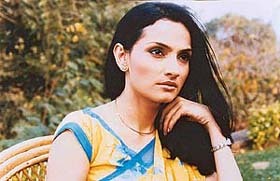 Krutika Desai, the bahu of Bunniyaad, is the evil mother of Khusum, Rajeshwari, the innocent girl of Margharita, is wicked Ambika of Kahani Ghar Ghar Ki, Sushmita Daan, the obedient daughter of Saans, has morphed into rebellious Madhu in Aati Rahengi Baharien. Finally, it would appear that the focus is shifting from the sugar-coated heroines to the fiery women in black. The baddies are finally getting their due, Mogambo khush hua! He’s hit the high road to success in as varied fields as TV anchoring, ads, serials, telefilms, music videos, and offbeat movies. Now he is all set to make his mark in Bollywood with Harry Baweja’s, Qayamat, where he shares the lead with Ajay Devgan. Aashish plays a nuclear scientist on a mission to save Mumbai which is facing a nuclear threat. The film also stars Raveena Tandon and Sunil Shetty. "I was very comfortable working with all the stars," says he. Aashish is no greenhorn himself. While still in college in Mumbai, his great looks and chiseled physique ensured him the assignment of the anchor for a Walt Disney TV show. And then he got an offer he couldn’t refuse. Yash Chopra approached him for the lead role in telefilm and he agreed. Hum Ko Ishq Ne Mara was telecast as part of the Star Bestsellers series. What followed were cameos in serials like Wajood, Vikram Bhatt’s Apne Jaise Types and then the biggie, Hum Pardesi Ho Gaye where he played Rahul. "The day I stop enjoying myself I’ll go back to modelling and make a decent living for myself. Life’s too short to stick around with just one option. There are so many things to do!" Indeed having achieved so much at 26, Aashish sure is roller-coasting to fame. It’s almost 50 years since Sherpa Tenzing Norgay and Edmund Hillary scaled Mt Everest on May 28, 1953. After that 574 persons have stood on top and 118 have died trying. At 8,850 metres, Mount Everest is the highest elevation in the world and every year continues to lure climbers. This year too, it will have its usual quota of adventurers but among them would be five people who are different from the rest. The National Geographic Channel and the Indian Army will be giving five people a once-in-a-lifetime chance to conquer Mount Everest. Mission Everest, starting April 20 every Sunday at 8 p.m., will have nine spellbinding episodes that will take you from Delhi to Bangalore and from Mumbai to Kolkata and Uttarkashi in search of five young adventurers who have the guts to dream the impossible. Once they are selected they will experience the taste of challenge, the agony of heartbreak and the glory of achieving the impossible — emotions that Everest usually brings forth! 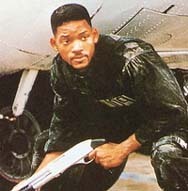 Will Smith in Bad Boys: Action time on HBO. With the hot season round the corner, HBO offers a cool way to beat the sweat with its summer treat. In the next three months, movie buffs will see their favourite stars in some of the greatest blockbuster of all times. From April till June, viewers will see movies on themes like Cute and Cuddly, Summer Action Marathon and the Unseen Epics all lined up to bring the best of Hollywood viewing. Giving a jump start to the movie mania is Arnold Schwarzenegger’s The 6th Day, Angelina Jolie with Winona Ryder in her Oscar winning role in Girl Interrupted, Jean-Claude Van Damme in Crimecop, Will Smith in Bad Boys and Sylvester Stallone and Kurt Russell in Tango and Cash. Action time is followed by the cute and cuddly stuff like K-All, Babe Pig in the City, Slappy and the Stinker, Buddy and Zeus and Roxanne — mostly unheard of films that could have easily been shown in the Unseen Epics category but fun all the same. So keep tuned. It’s the summer of movies on HBO. Renowned wildlife authority and celebrated host David Atten borough spans the globe documenting the true lives of the most accomplished aeronauts. From the Arctic to Antarctica, Animal Planet’s premiere series Life of Birds every Sunday at 5 p.m. covers 300 species of birds, revealing their fascinating behaviours and unique lifestyles. Using cutting-edge filming techniques, this series explores the secret of birds including their remarkable strategies for finding food, complex social systems and ingenious ways of mating and breeding. From high-speed aerial hunters and long-distance migrants to brilliantly coloured nectar-grazers, the comical and the bizarre, Life Of Birds is an award-winning series that takes viewers on a tour of 42 countries in search of the world’s clever and engaging conquerors of the air.